I have been using the OnePlus 6 for a month now, which is I think a perfect amount of time to provide a full review. The things we love and the things we don’t love as much. Head’s up use the link below to get $20 towards accessories (cases, etc.) with the purchase of a OnePlus 6. Thumb Drive support. I use a thumb drive to move files from phone to PC and no issues with other android devices out there, but can’t get it to work with the OnePlus 6. UPDATE: Per YouTube comments, this can be enabled in the settings – will update! No expandable storage. Personally, this isn’t a big deal for me, I tend to delete photos, video and files that have been backed up. However, if you are one to have a lot of apps and files, just get the 128GB or 256GB version and you don’t have to worry about running out of space. Now about the awesome things with the OnePlus 6 – pretty much everything else. For me the main things that make this phone awesome are: camera, battery life and performance. The camera on the OnePlus 6 takes awesome pictures. Outdoor shots are great and capture a lot of detail. Selfie camera works just as well. For video recording your options are resolution, shooting at 720P, 1080P, 1080P 60FPS, 4K, 4K and 4K at 60FPS (which will take up a lot of space). The camera options are timer (3, 5 and 10 seconds), HDR, aspect ratio and flash. You can also take portrait photos in bokeh mode. The only other smartphone that can take better pictures is the Huawei P20 Pro. I am averaging about 1.5 days on my OnePlus 6, I am not a heavy user, most of my in phone use is mostly replying to test messages and WhatsApp messages. I also use it when I am running or cycling for tracking and music playing, which would be the most intense use I get from the phone. One awesome thing I do like is the dash charger, I am able to get a lot of juice in a short amount time. If I had one minor complaint is that the cable isn’t long enough and other cables don’t support the dash charge. Our unit is the 8GB RAM + 128GB Storage version, and haven’t had any issues. Multitasking is great and switching apps is quite fast. The Oxygen OS (version 5.1.8) that runs with Android 8.1 Oreo doesn’t slow down the device. The skin is minimal adding the community application and a shelf to access recent apps, contacts and the dashboard. 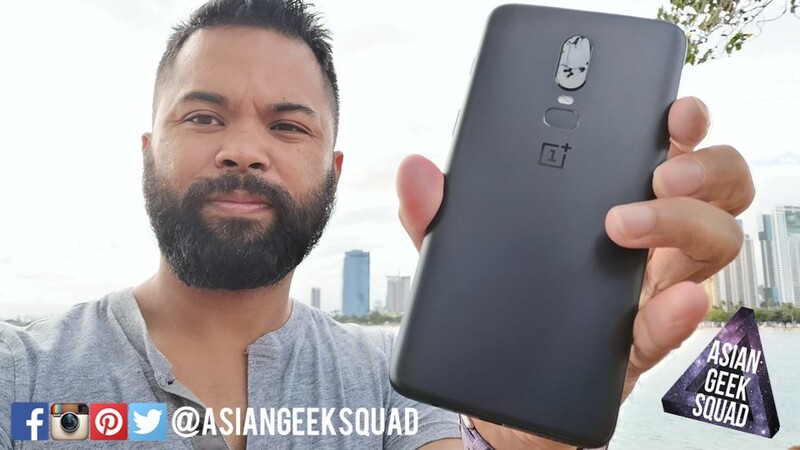 The OnePlus 6 is a solid top of the line smartphone for a price that is affordable. Have any questions – comment via our YouTube channel or tweet us!